Food waste is a huge global issue. Every year, UK households throw away £13 billion worth of food. A staggering 7.3 million tonnes of household food waste was thrown away in 2015, according to the waste advisory body WRAP. And of that, some 4.4 million tonnes was deemed to be ‘avoidable’ waste, perfectly edible at some point before it was put in the bin. It’s therefore exciting to see online supermarket Ocado determined to eliminate food waste from their supply chain. Ocado’s unique, automated business model runs on efficiency – fresh products can arrive from suppliers and be out for delivery in as little as five hours. Every bag of shopping is packed in one of its huge fulfilment centres, equivalent in size to 30 supermarkets. Fewer locations make forecasting less risky than for supermarkets with hundreds of stores. On top of that, proprietary technology and a focus on efficiency means Ocado’s food waste is incredibly low. Just one in 6,000 items goes to waste: that’s less than 0.02%. The benefits of their business model aside, Ocado have a few other strategies to reduce food waste; some even stretch inside their customers’ homes. Receipts are automatically arranged by the correct storage method – fridge, cupboard, or freezer – and by Use-By dates, helping customers plan their meals for the week ahead. Ocado’s Product Life Guarantee promises customers that the products they receive will have the longest Use-By dates possible, maximising the amount of time they have to enjoy food at home. Products at risk of falling below this guarantee are heavily discounted and offered to bargain-hunting customers as they check out. But if these measures don’t work, Ocado’s strategy is to make sure the food is redistributed, rather than wasted. In 2017 Ocado redistributed over 2,200 tonnes of food. The only food wasted is inedible – such as defrosted frozen items, or fresh products like meat where packaging seals have been broken. None of their food waste goes to landfill. Like lots of other retailers, for many years they’ve sold food with short shelf life to Company Shop, the UK’s largest redistributor of surplus products. When the charitable arm of Company Shop – Community Shop – launched in 2015, they were one of the first supermarkets to sign up and publicly support the venture, which helps people in food crisis regain financial independence. On top of that, they have built relationships with charities and organisations local to their three Customer Fulfilment Centres and 15 of their 19 delivery hubs. Each Food Partner is chosen for their individual approach to feeding thousands of people at risk of, or experiencing, food poverty. Some operate as food banks while others specialise in redistributing food to community cafés, smaller charities, and community organisations. Testament to their commitment to putting edible food in bellies, not bins, Ocado even has relationships with local animal parks and zoos. “My aim is close all the loopholes, so that there’s nothing edible left at the end. Even if we can’t find a suitable food charity, we’ll send food that’s safe to eat to local animal parks, right down to the last bruised banana,” says Suzanne Westlake, Ocado’s Head of Corporate Responsibility. Ocado makes getting shopping out of its Fulfilment Centres look easy, but if a customer cancels their order after despatch, it’s not hygienic to put it back. The unpredictability of this poses a significant risk of food waste. Out of 19 delivery hubs, 15 work with FareShare and The Real Junk Food Project, organisations specialising in redistributing food though community cafés or smaller community groups. Cancelled orders come back to the hub, age-restricted and frozen items are removed, but the rest is available for Food Partners to collect and redistribute. Food hygiene is an obvious hurdle to redistributing fresh food. To prevent potential food poisoning further down the line, Ocado’s Food Partners sign a donation agreement, promising they’ll comply with the Food Safety Act, and keep food at the correct temperature. Financially, refrigerated transport proved to be a big hurdle for smaller, independent Food Partners based in Hampshire, Wiltshire, Hertfordshire, Yorkshire, and the West Midlands. “We can’t let people take perishable food if they can’t keep it at the correct temperature, it’s just not safe. Some of our Food Partners were spending vast amounts on refrigerated van hire, or fundraising to buy transport and fridges for storage, so it made sense to step up and help,” Westlake says. 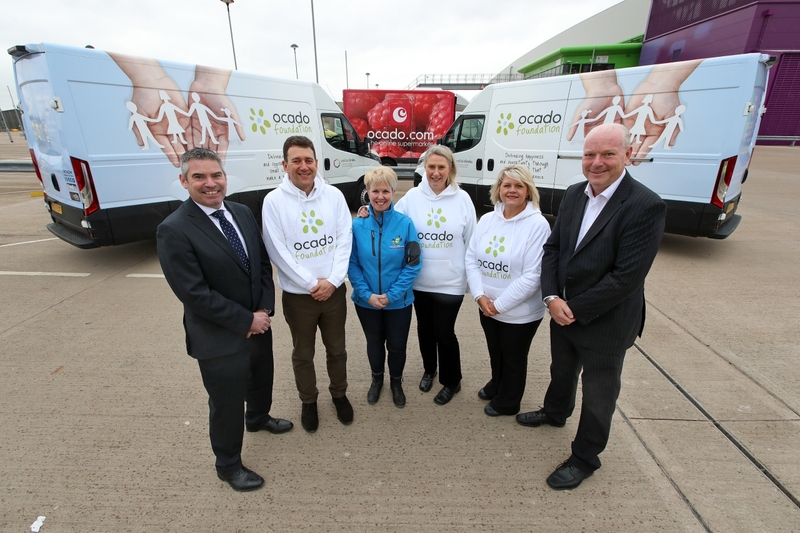 Ocado has donated eight refrigerated vans to charities they work with, making it easier for them to collect and redistribute fresh food to local families and community groups. The vans are taxed, insured and maintained on behalf of each charity, and drivers are given risk management training to keep them safe on the road. Financing for the vans comes from the Ocado Foundation, custodian of all charity money, including the proceeds from single-use carrier bag legislation. “By law, we’re obliged to charge customers 5p for every carrier bag used. The Foundation takes responsibility for these funds, and they’re used for waste-reducing and recycling initiatives, feeding into the spirit of the legislation, which aims to reduce littering and protect wildlife,” adds Westlake. For example, one charity partner runs a 41-bed homeless shelter, so it always needs lots of bread. Another works with a mother and baby group on certain days of the week, so on those days they increase donations of milk, yoghurt and fresh fruit. This tailored approach is helping Ocado build links with surrounding communities and answer a frequent customer request for ways to donate food as they shopped. Customers can choose £2.50, £5, or £10 Donate Food With Ocado charity vouchers to add to their order. For every pound donated, the company donates at least two pounds worth of food to charities and food banks. Matched food comes from the nearest fulfilment centre, so donations stay local. “Customers wanted to donate food locally. Most high-street supermarkets have a local food bank bin they can put a tin of beans, or a box of cereal into. The problem with this model is that food banks only get dry or tinned goods in unpredictable amounts. So we turned the donation model on it’s head, and gave the food banks a way to request fresh, nutritious food in the quantities they need, so they can redistribute food more efficiently,” says Westlake. Since 2014, customers have donated over £260,000 with Ocado donating food worth over half a million pounds to food banks. This system is unique, reducing food waste, offering customers the opportunity to donate locally as part of their weekly routine, and most importantly, empowering Food Partners. Delivering fresh, quality food to customers as efficiently as possible is a central tenet of Ocado’s business strategy. Now, that benefits those in food crisis, too: around 95% of donated food is fresh meat, fish, fruit, and vegetables.